Arrested as a Freedom Rider in June of 1961, Carol Ruth Silver, a twenty-two-year-old recent college graduate originally from Massachusetts, spent the next forty days in Mississippi jail cells, including the Maximum Security Unit at the infamous Parchman Prison Farm. She chronicled the events and her experiences on hidden scraps of paper which amazingly she was able to smuggle out. These raw written scraps she fashioned into a manuscript, which has waited, unread for more than fifty years. Freedom Rider Diary is that account. Freedom Riders were civil rights activists who rode interstate buses into the segregated southern United States in 1961 to test the US Supreme Court rulings outlawing segregation in interstate bus and terminal facilities. Brutality and arrests inflicted on the Riders called national attention to the disregard for federal law and the local violence used to enforce segregation. Police arrested Riders for trespassing, unlawful assembly, and violating state and local Jim Crow laws, along with other alleged offenses, but they often allowed white mobs to attack the Riders without arrest or intervention. 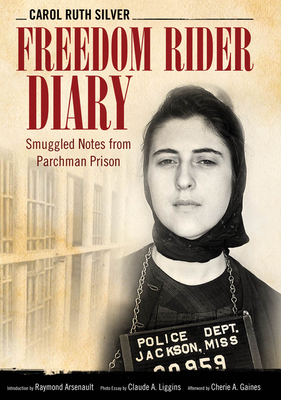 This book offers a heretofore unavailable detailed diary from a woman Freedom Rider along with an introduction by historian Raymond Arsenault, author of the definitive history of the Freedom Rides. In a personal essay detailing her life before and after the Freedom Rides, Silver explores what led her to join the movement and explains how, galvanized by her actions and those of her compatriots in 1961, she spent her life and career fighting for civil rights. Framing essays and personal and historical photographs make the diary an ideal book for the general public, scholars, and students of the movement that changed America.